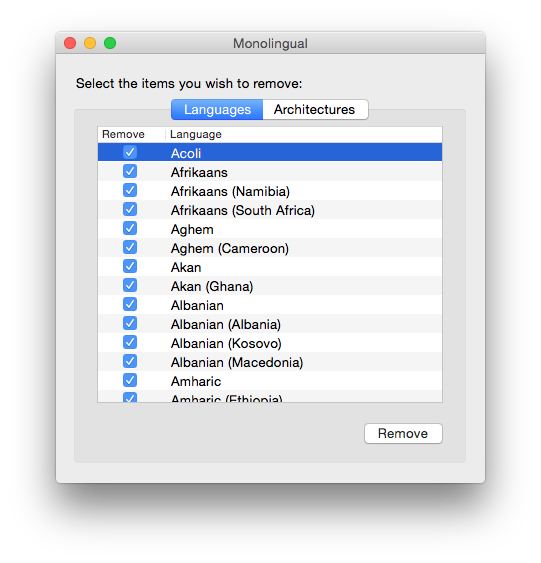 Monolingual is a program for removing unnecessary language resources from macOS, in order to reclaim several hundred megabytes of disk space. It requires a 64-bit capable Intel-based Mac and at least macOS 10.13 (High Sierra). I don&apos;t know about you, but I use my computer in only one (human) language — English. And I&apos;m willing to bet that you do too, albeit perhaps not English. So why do you have a bunch of localization files for the operating system filling up your hard drive? Enter Monolingual — a handy utility for reclaiming your space for more useful things… like international mp3 files, email or whatever you like. Version 1.7.8 is the last version for OS X 10.12 (Sierra). Version 1.7.3 is the last version for OS X 10.11 (El Capitan). Version 1.6.7 is the last version for OS X 10.10 (Yosemite). Version 1.5.10 is the last version for Mac OS X 10.7 (Lion), OS X 10.8 (Mountain Lion) and OS X 10.9 (Mavericks). Version 1.4.5 is the last version for Mac OS X 10.6 (Snow Leopard) which also includes PowerPC support. Version 1.3.9 is the last version for Mac OS X 10.4 (Tiger).